Can't believe it's already time for so many kids to be heading back to school! 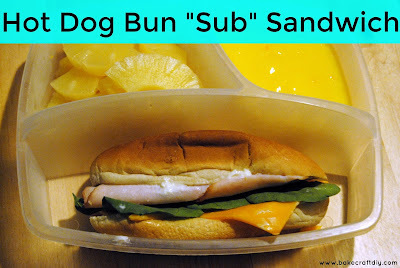 This delicious Hot Dog Bun "Sub" Sandwich creates a yummy school lunch while also providing a way to eat leftover buns because (for reasons unbeknownst to me) the makers of hot dogs and the makers of hot dog buns cannot seem to make the same amount of food. We bought an 8 pack of hot dogs with a 10 pack of buns and as a bonus my one year old is currently not interested in eating buns which means we had three extra buns after dinner. This sandwich is the perfect solution to the too many buns problem, it may even have you buying extra buns just so your child can take a sub sandwich to school! I'd even pack this for my husband with some extra insides. One slice of cheddar cheese, 4 lettuce leaves, 3 small slices of smoked turkey, the bun, and mayo and mustard.